Elliot Wolfe is certified by the State Bar of Arizona as a specialist in handling personal injury and wrongful death cases. He has been named as one of the “Best Lawyers in America” for over 20 consecutive years, and is the only plaintiff’s’ attorney in Arizona to have been so named in each of three separate categories: personal injury, medical negligence and defective product liability. 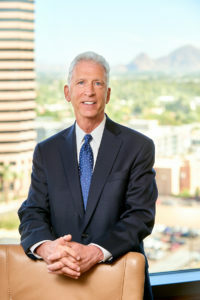 Mr. Wolfe is the 201 3 Phoenix LAWYER OF THE YEAR in plaintiffs’ medical negligence law, and was most recently named as the 2014 Phoenix LAWYER OF THE YEAR in representing plaintiffs in personal injury cases. He graduated from Columbia University, where he was the captain of the basketball team, and the recipient of the Rolker Prize as the school’s outstanding scholar-athlete. He played four years of professional basketball in Europe before he earned his law degree at Arizona State University. He is a fellow of the prestigious American College of Trial Lawyers, and a member of the President’s Club of the American Association for Justice for which he was the founder and chairman of Interstate Trucking Litigation Group. If you believe that you may have a claim for your own injury, or for the wrongful death of a loved one, due to the fault of a driver, a doctor, nurse, hospital, trucking company or product manufacturer or seller, Mr. Wolfe and his staff would be happy to speak with you about your potential claim. They may be reached at (800) 752-1570. View Elliot’s legal profile on Avvo, Justia and HG.